Farro has long entered the world of food rock star. Once a humble grain, a staple in ancient Rome it is now found on the menus of every Italian restaurant from New York to San Francisco. 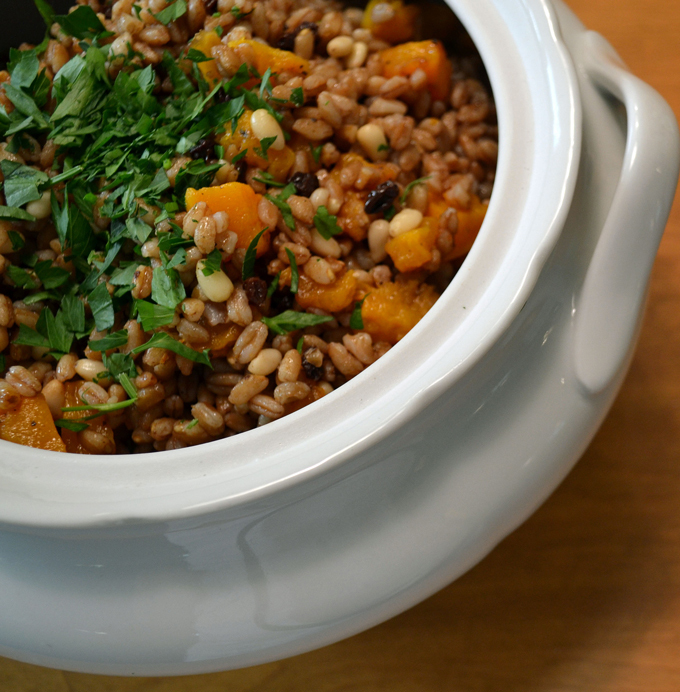 There are actually some good reasons for this; farro’s distinctive nutty taste, delicate bite, and versatile nature make it perfect for adapting seasonal dishes. The instructions for preparing farro are universal. Once you have done so, it provides a blank palate for an infinite variety of dishes. This particular version is a family favorite and an excellent vegetarian entrée. 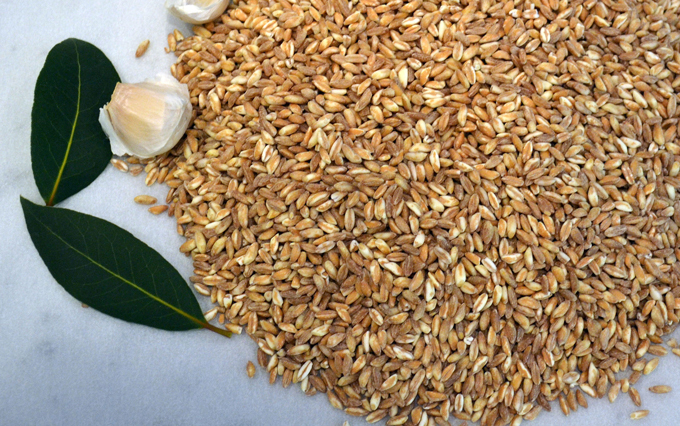 Many converts to farro, initially find the cooking time lengthy and become discourage with tackling the grain on a regular basis. Semi-pearled and pearled faro indicates that some or all of the bran has been removed, thus lending itself to a reduced cooking time. With the removal of the bran, there is a loss of nutrients; so you decide, longer cooking time or nutrients. In a large bowl combine the Balsamic vinegar reduction, sliced garlic, kosher salt, black pepper, extra virgin olive oil, currants and pine nuts; stir to combine. Preheat the oven to 400 degrees, line a baking sheet with parchment paper. Place the cubed squash onto the lined baking sheet, drizzle with the olive oil and season with salt and pepper. Roast until the squash is golden and tender, about 25 minutes, stirring midway during the roasting process. Remove, reserving to add to the farro. Bring 8 cups of water to a boil over high heat. Once the water come to a boil, add the bay leaves, garlic, 1 teaspoon of kosher salt and faro. Stir, return to a boil, reduce the heat and simmer uncovered for 20 minutes or until the farro has softened but it not mushy. Drain well, remove the garlic & bay leaves and immediately add to the dressing, combining well as to coat all of the grains of faro. Adding the farro to the dressing while warm will allow the grains to absorb the flavor, let it sit for at least one hour. Remove the sliced garlic and add the roasted squash, gently mixing to incorporate. Garnish with the chopped parsley. This dish may be served immediately or at room temperature. It may also be prepared a day in advance, refrigerated and brought back to room temperature. Empty the contents of a bottle of commercial manufactured balsamic vinegar into a saucepan or skillet, place over low heat and reduce by two thirds. Allow the vinegar to cool and place into an empty wine bottle fitted with a pour spout. The process of reduction results in a richer, more full bodied vinegar product.